Producer: Roger Chang – Roger started out in technology reporting by working on ZDTV later known as TechTV. After TechTV went away, Roger began working for a small little company called Revision3 who produced a show called Tekzilla with Patrick Norton and Veronica Belmont, later Shannon Morse. 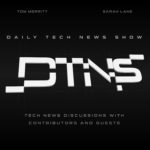 After the show was cancelled and Roger was let go by Revision3, he went to work for DTNS as a video editor and producer. Music: Martin Bell for the opening and closing theme. Dan Lueders for the Top Stories theme. Subreddit mods: scottierowland, Jack_Shid, Kylde, tgstellar, and KAPT_Kipper. This page was last modified on 22 October 2018, at 22:02. This page has been accessed 27,116 times.